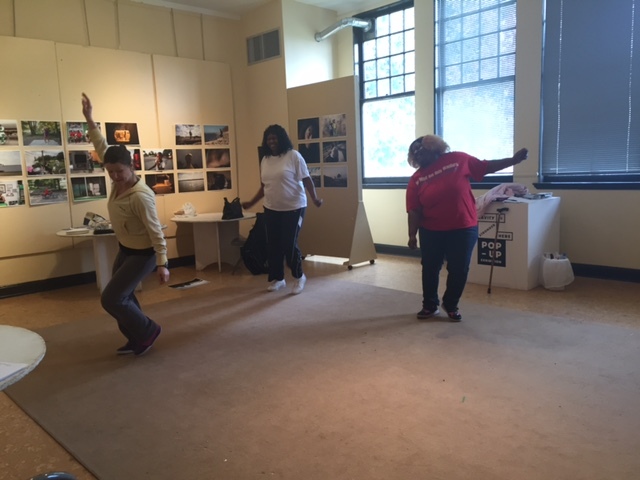 Using Dance in the Classroom CEU Workshop was a blast–more workshops to come! The GAC hosted its first CEU workshop for the 2015-2016 school year on Saturday, November 14th. Participants took part in basic yoga and stretching, then got into some dancing with teaching artist Emily Tschiffely (check out her website here). Emily also taught us about the history of dance and led discussions on creative ways to incorporate dance and dance history into the classroom. 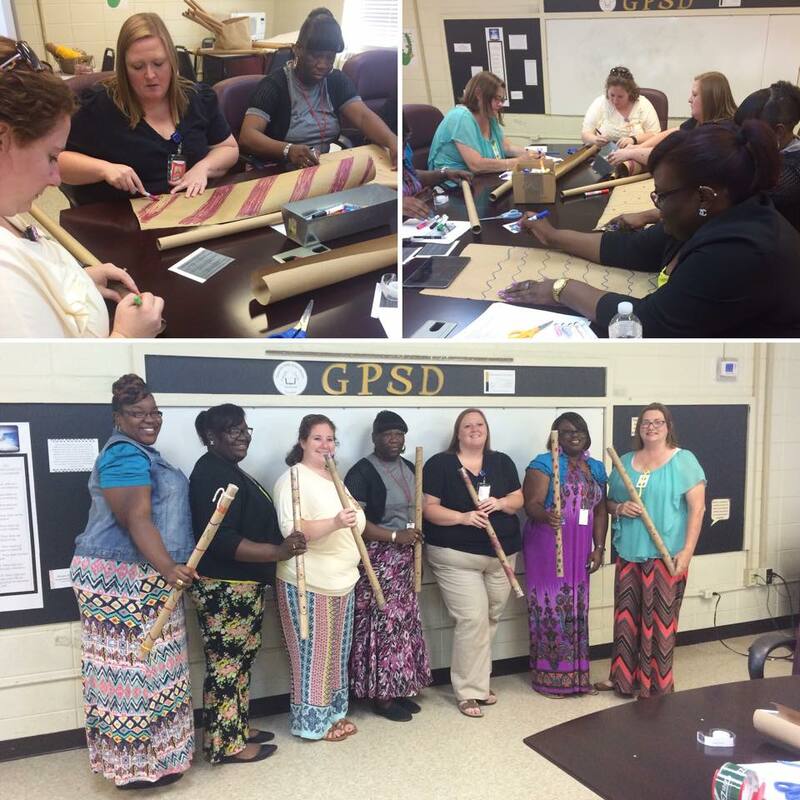 Teachers had a fantastic time at the workshop, and we’re already looking forward to the next CEU workshop, which will be Saturday, January 23rd, 2016, and will focus on connecting African drumming/music with core curriculum. The GAC is hoping for a better turnout at the January workshop, so start spreading the word now! Teachers, these workshops are a fun, engaging way to gain CEU credit, and your students will benefit immensely from the creativity and arts integrated activities you’ll learn to incorporate into your classroom. Who knew getting CEU credits could be this fun? For more info about CEU workshops, contact Lesedi Chambers at execadmin@greenville-arts-council.com or at 662-332-2246. Stay tuned for updates about the 2016 workshops! 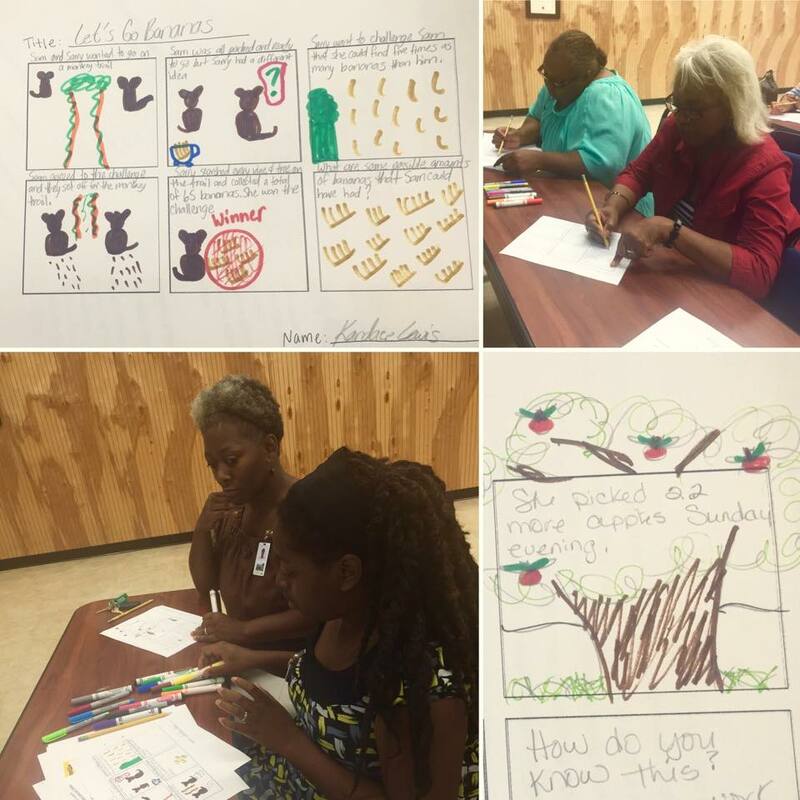 Over the past two weeks, we facilitated professional development (PD) sessions with 3rd and 4th grade GPSD teachers. 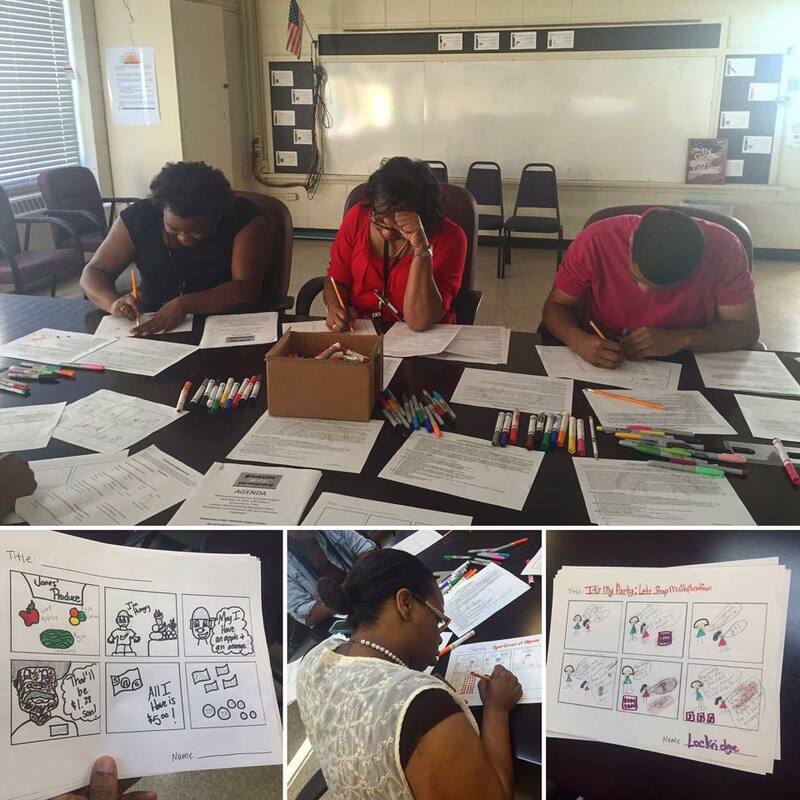 Teachers got creative making their own original comic strips to illustrate math concepts. They also learned how their students can create comics to test their classmates with math word problems, summarize a book they read in class, or demonstrate their understanding of a range of subjects. Resources and handouts from these PD sessions can be found on the “2015-2016 Resources” page, which is located under the “Resources for Educators” tab. 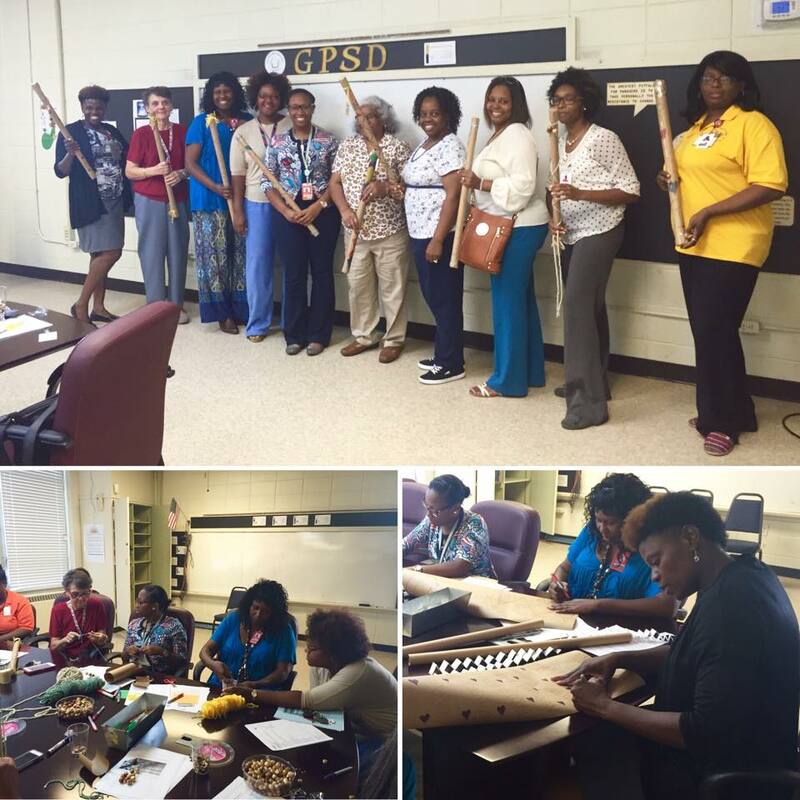 This week, we had professional development sessions with 1st and 2nd grade GPSD teachers. They learned how to use the Kennedy Center’s ArtsEdge website (which is a fantastic resource for arts-integrated lesson plans) and participated in part of a model lesson from the site connecting social studies, science, and ELA concepts with visual art. Through this lesson, the teachers made their very own rain sticks! Check out pictures and videos below from the two sessions. Check out the 2nd grade teachers makin’ it rain (video on FaceBook)! Resources from these PD sessions can be found on the “2015-2016 Resources” page, which is under the “Resources for Educators” tab.